Presenting a case of atraumatic fracture neck femur secondary to 2 years of prolonged lactation. A 26-year-old lactating mother presented with pain in left hip from last 12 months. She was apparently alright before and during pregnancy. Plain radiograph showed a complete undisplaced fracture of femoral neck. Osteomalacia was diagnosed by radiological and serological investigations. The fracture was fixed using AO type cannulated cancellous screws. The fracture showed good clinical and radiological union at 3 months. Literature review shows that this is a first case of atraumatic fracture of neck femur due to prolonged lactational osteomalacia. It showed that even apparently healthy Indians are susceptible to osteomalacia, more so during pregnancy and lactation and can be presented as atraumatic fracture. Although considered relatively stable, a compression type incomplete fracture neck femur may progress to a complete fracture if not treated in time. The first case reported on bilateral loser's zones in neck femur of an Asian pregnant lady, which was treated conservatively with oral vitamin D and calcium with resultant good healing was published in 1985. 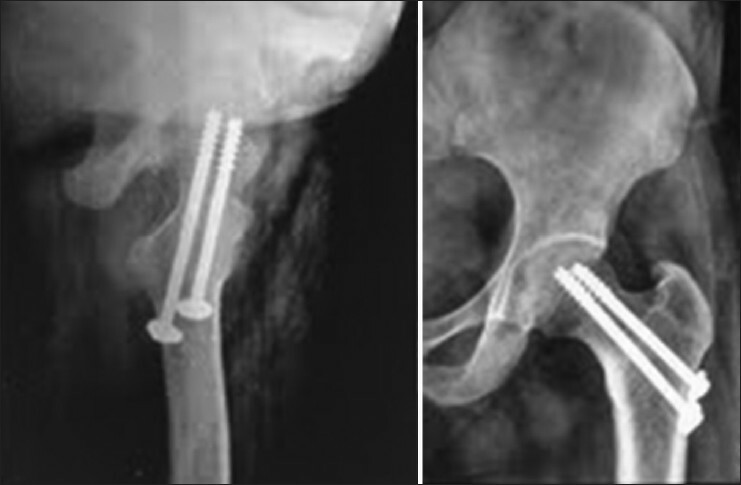 In 2003 a case of unilateral atraumatic displaced fracture of femur neck due to pregnancy induced osteomalacia was reported which was claimed to be first report of its kind. Probably the first case of atraumatic bilaterally displaced fracture of neck femur due to osteomalacia during pregnancy of an Asian woman was documented in 2011, which went on to heal completely in spite of delay in treatment with internal fixation, calcium, and vitamin-D supplements. However, it appears that osteomalacia leading to atraumatic fracture of the neck of femur due to prolonged lactation has not been reported in the literature and this case report appears to be the first of such kind. 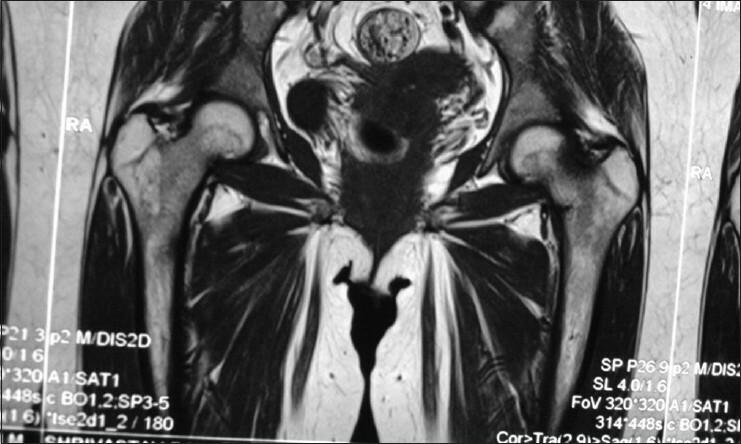 A 26-year-lactating female of Indian origin presented with history of insidious onset of left hip pain from 1 year. She had no history of trauma or sudden increase in physical activity. She was not on any medication nor had any significant medical history. She delivered a full term normal male child 2 years back. She was breast feeding on demand, till the time of presentation. She was not on any calcium or vitamin D supplementation during pregnancy and lactation. Pain was localized, dull aching, increased gradually, and aggravated on exertion. On clinical examination, she had an antalgic gait, with deep tenderness in the anterior aspect of hip and trans-trochanteric thump test positive. Plain radiograph [Figure 1] revealed incomplete compression type fracture. She was advised hospitalization and serological investigations, for which she refused. She was given injectable Vitamin-D3 600000 IU, oral calcium 1000 mg twice daily, and was advised complete bed rest. She again presented after 2 months with aggravated pain, inability to bear weight, and perform activities of daily living. She agreed to hospitalization this time, after which further radiological and serological tests were performed. This time the radiograph showed an undisplaced but complete fracture of neck femur. 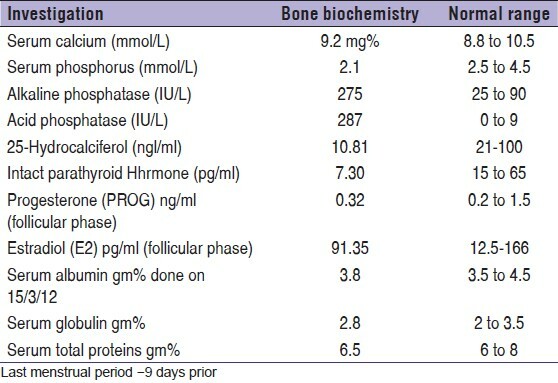 Her serological investigation showed serum 25-OH Vitamin D total levels of 10.81 (2 months after 600000 IU intramuscularly, with reference range of 6-20 ng/ml as insufficiency) and also had high levels of alkaline and acid phosphatase and a lower parathyroid hormone [Table 1]. Her DEXA scan for bone mineral density study was done which showed a T-score of −2.5 suggesting osteopenia. A plain CT Scan [Figure 2] and a 3-D CT reconstruction [Figure 3] were ordered to study the fracture morphology in further details. CT scan showed discontinuity of the cortical margin of the neck of left femur, extending medially as well as laterally with mild adjacent sclerosis. 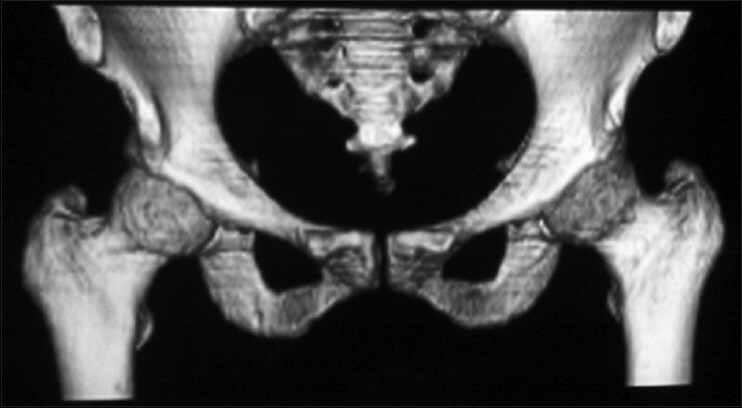 A plain MRI of hip joints [Figure 4] was also ordered, to rule out avascular necrosis of the femoral head as she had symptoms for more than a year long and also to get further information about the fracture morphology, this showed linear altered signal intensity area involving neck of left femur with altered signal intensity which is hyperintense on STIR and hypointense on T1W1- suggestive of fracture with marrow oedema. After appropriate pre-anesthesia workup, she was treated with internal fixation of fracture with two AO type screws [Figure 5]. She was also treated with injectable Vitamin-D3, 600000 IU intramuscularly, and supplemented with oral vitamin-D3, 60000 IU every week and oral calcium 1 g twice a day. Adequate sunlight exposure was advised (30 min/day). She was also educated about her medical condition and prolonged lactation. She stopped breast feeding the child. She was also given oral medications to suppress her lactation. She was advised about proper dietary habits and nutrition. She was encouraged to consume milk and milk products along with a high protein diet. She was mobilized non-weight bearing immediately after surgery for one and half months following which she gradually increased weight bearing till full weight at 3 months. She was followed up for 12 months. The fractured completely healed clinically and radiographically at around 3 months. Osteomalacia is highly prevalent even in apparently healthy looking Indian population, although this is easily preventable and treatable condition. This case is of particular importance as it highlights the tip of the iceberg of this problem. It shows that even apparently healthy Indians are susceptible to osteomalacia, more so during pregnancy and lactation. There is extensive literature available related to pregnancy and osteomalacia, but there are very few research papers on lactation and osteomalacia in Indians. This case appears to be the first to describe atraumatic fracture neck femur due to prolonged lactation. There is usually a delay in presentation to the hospital on part of the patient as it presents with vague symptoms and later as gradually increasing pain. There may be delay in diagnosis and hence treatment, in the initial stage by treating physician because of atraumatic presentation, vague patient complaints, and subtle plain radiographic findings. Fracture neck femur has the propensity for complications like delayed union, non-union, and avascular necrosis of head femur and hence this assumes greater significance. Although atraumatic fracture of neck of femur due to lactational osteomalcia is rare, lactational osteomalacia is just the tip of the iceberg of a problem that is prevalent in Indian sub-continent even in apparently healthy population. Thus, we have to be constantly aware and open to deal appropriately with the adverse effects of sub-clinical and overt osteomalacia on the skeletal health, with its varied presentation especially in this susceptible population. Osteomalacia can be prevented by public awareness, calcium and vitamin-D supplementation during pregnancy and lactation and by appropriately restricting the period of lactation. This case of atraumatic fracture of neck femur due to prolonged lactation appears to be first case report of its kind. This case was managed well by in situ internal fixation using cannulated cancellous screws, oral calcium and vitamin-D supplementation, and patient awareness. It appears rather surprising that in Indian subcontinent, a totally preventable nutritional disease still prevails. 1. Dandona P, Okonofua F, Clements RV. Osteomalacia presenting as pathological fractures during pregnancy in Asian women of high socioeconomic class. Br Med J 1985;290:837-8. 2. Henry A, Bowyer L. Fracture of the neck of the femur and osteomalacia in pregnancy. Int J Obstet Gynaecol 2003;110:329-30. 3. 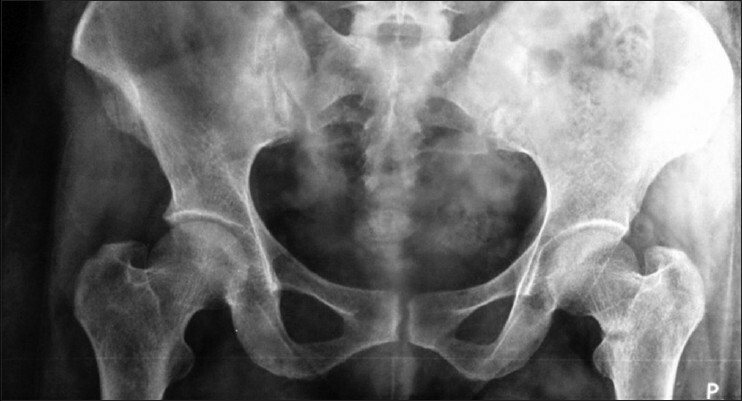 Docker C, Starks I, Wade R, Wynn-Jones C. Delayed fixation of displaced bilateral, atraumatic, femoral neck fractures in a patient with pregnancy related Osteomalacia. Acta Orthop Belg 2011;77:402-5. 4. Marwaha R, Tandon N, Reddy D, Aggarwal R, Singh R, Sawhney R, et al. Vitamin D and bone mineral density status of healthy schoolchildren in northern India. Am J Clin Nutr 2005;82:477-82. 5. Bhambri R, Naik V, Malhotra N, Taneja S, Rastogi S, Ravishanker U, et al. Changes in bone mineral density following treatment of osteomalacia. J Clin Densitom 2006;9:120-7. 6. Goswami R, Mishra S, Kochupillai N. Prevalence and potential significance of vitamin D deficiency in Asian Indians. Indian J Med Res 2008;127:229-38. 7. Cashman K, Hill T, Lucey A, Taylor N, Seamans K, Muldowney S, et al. Estimation of the dietary requirement for vitamin D in healthy Adults. Am J Clin Nutr 2008;88:1535-42. 8. Heaney R. Functional indices of vitamin D status and ramifications of vitamin D Deficiency. Am J Clin Nutr 2004;80 (Suppl):1706S-9. 9. Kovacs Christopher S. Vitamin D in pregnancy and lactation: Maternal, fetal, and neonatal outcomes from human and animal studies. Am J Clin Nutr 2008;88 (Suppl):S520-8. 10. Specker B. Vitamin D requirements during pregnancy. Am J Clin Nutr 2004;80 (Suppl):1740S-7. 11. Nanavati RN, Mondkar JA, Fernandez AR, Raghavan KR. Lactation management clinic-positive reinforcement to hospital breastfeeding practices. Indian Pediatr 1994;311385-9. 12. Bandyopadhyay M. Impact of ritual pollution on lactation and breastfeeding practices in rural West Bengal, India. International Breastfeeding Journal 2009;4:2. 13. Gopalan C, Kaur S. Women and Nutrition in India. Nutrition Foundation of India, special publication series 5. 14. NNMB (National Nutrition Monitoring Bureau). NNMB Reports. National Institute Of Nutrition, Hyderabad, 1979-2002. 15. Olausson H, Goldberg G, Laskey M, Schoenmakers I, Jarjou L, Prentice A. Calcium economy in human pregnancy and lactation. Nutrition Research Reviews. Vol. 25. Cambridge, England: Cambridge University Press; 2012. p. 40-67. 16. Prentice A. Micronutrients and the bone mineral content of the mother, fetus and newborn. J Nutr 2003;133:S1693-9. 17. Jarjou L, Prentice A, Sawo Y, Laskey M, Bennett J, Goldberg G, et al. Randomized, placebo-controlled, calcium supplementation study in pregnant Gambian women: Effects on breast-milk calcium concentrations and infant birth weight, growth, and bone mineral accretion in the first year of life. Am J Clin Nutr 2006;83:657-66. 18. Kent G, Price R, Gutteridge D, Rosman K, Smith M, Allen J, et al. The efficiency of intestinal calcium absorption is increased in late pregnancy but not in established lactation. Calcif Tissue Int 1991;48:293-5. 19. Shatrugna V, Kulkarni B, Kumar P, Rani K, Balakrishna N. Bone status of Indian women from a low-income group and its relationship to the nutritional status. Osteoporos Int 2005;16:1827-35. 20. Arya V, Bhambri R, Madan M. Godbole M, Mithal A. Vitamin D status and its relationship with bone mineral density in healthy Asian Indians. Osteoporos Int 2004;15:56-61. 21. Malhotra N, Mithal A. Osteoporosis in Indians. Indian J Med Res 2008;127:263-8. 22. Vijay J, Kapil U. Vitamin D deficiency and its health consequences: A review. Indian J Community Health 2012;24;3:232-6. 23. Sachan A, Gupta R, Das V, Agarwal A, Awasthi P, Bhatia V. High prevalence of vitamin D deficiency among pregnant women and their newborns in northern India. Am J Clin Nutr 2005;81:1060-4. 24. Prentice A. Milk intake, calcium and vitamin D in pregnancy and lactation: Effects on maternal, fetal and infant bone in low- and high-income countries. Nestle Nutr Workshop Ser Paediatr Program 2011;67:1-15. 25. Harinarayan C, Ramalakshmi T, Prasad U, Sudhakar D. Vitamin D status in Andhra Pradesh: A population based study. Indian Journal Med Res 2008;127:211-8. 26. Hollis B, Wagner C. Vitamin D requirements during lactation: High-dose maternal supplementation as therapy to prevent hypovitaminosis D for both the mother and the nursing infant. Am J Clin Nutr 2004;80 (Suppl):S1752-8.